Halloween is a very special holiday in Canada, it's the one time of the year where communities really connect! Children go door to door trick or treating dressed up as their favourite characters and neighbours open their homes give out candy and treats to the local ghouls and goblins. But there are a few rules of the road for trick or treaters. Here are my tips for parents to help their little ghouls and goblins trick-or-treat tactfully. 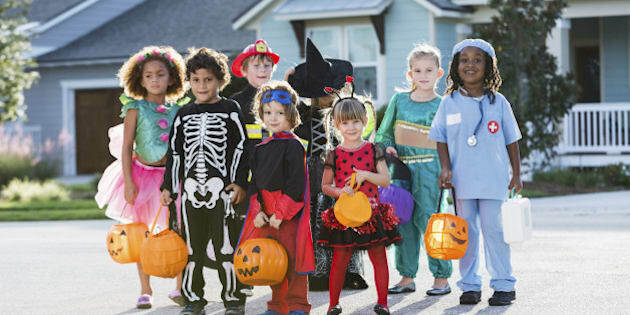 Multi-ethnic group of children 3-6 years old, wearing halloween costumes. Although it may seem innocent enough, the costume your child chooses to wear says a lot. Recently the guidelines around what children should choose to wear have become much more stringent. For example schools in Fort McMurray recently stopped allowing clown costumes after the rash of recent "creepy clown" incidents to avoid causing any additional stress or uneasiness during Halloween. Great costumes are funny and clever or spooky but not offensive or terrifying. A good rule of thumb is that the costume should pass the 20-year test. If you think your child would be proud to find a photo of themselves wearing the costume in 20 years than you're probably on the right track. There are some pretty adorable highly Canadian ideas here. It should go without saying but manners make all the difference between a great night trick-or-treating and a night of being reprimanded or getting short changed at the door. Encourage your trick-or-treaters to follow the conventions of saying "Trick-or-Treat" when they arrive at the door and then please have them say "Thank you, Happy Halloween" when they've received their loot. And always encourage them not to ask for more than they've been given - that rarely lands well with Halloween hosts! Part of having great manners is not only what you say but also how you behave. Trick-or-treaters should be encouraged to line up at the door and wait their turn when the Halloween host is handing out candy. They should be particularly mindful of younger trick-or-treaters who may be nervous about being out in the dark with so many strangers. Also, a big no-no is grabbing candy from a bowl that is presented - they should wait until it's offered and who knows if they're patient and polite they might even get an extra treat! The universal symbol in Canada that a house is open to trick-or-treaters on Halloween is a pumpkin on the front step, preferably one that is lit. Children should avoid going up to houses that do not have pumpkins and ideally should select houses with pumpkins that are lit. If they have a carved pumpkin with the lights out, that often means the house is out of candy and closed for the night. An exception to this is if a house has a pumpkin out front that is not carved. Sometimes these houses are "open" but in many cases it is just a fall decoration so trick-or-treaters can go ring the bell but they shouldn't be surprised if there's no answer. Although a certain amount of shenanigans used to be tolerated at Halloween, like toilet papering houses, mischief is no longer an option. No matter how frustrated a trick-or-treater is by a house being closed or by receiving a less than ideal treat (i.e. toothbrushes), these impolite tricks are never an option.